When I was invited to Hotel Lucky Bansko Spa and Relax to visit them and write a hotel review, I had mixed feelings. I considered I already knew everything about the area and didn’t think I will find something new and original to write about. Many years ago, I spent three years in this region, in the nearby Razlog. Now, after my weekend in the ski capital of Bulgaria, I can honestly say that your holidays in Bansko Bulgaria can be surprisingly packed with activities in every season. 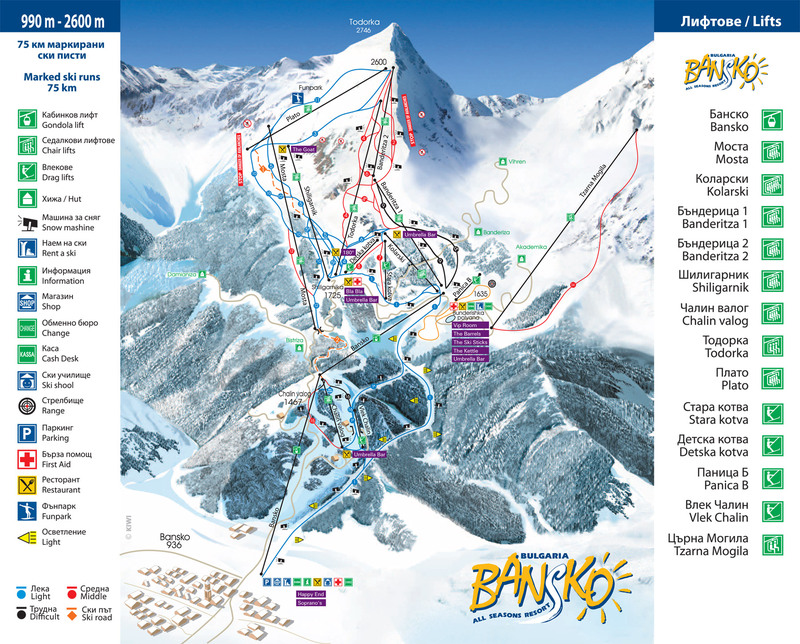 Bansko is the most popular winter destination in Bulgaria because of its extended ski slopes – 70 km running from an altitude of 990 m to 2600 m. See the Bansko runs map. In the past, Bansko was and still in a way is one of these small mountain towns and villages where the Bulgarian traditions can be seen and felt through architecture, cuisine and even mentality. Long before becoming an international ski destination, the town was one of the most loved spots for Bulgarians in winter. Now, in the recent years, I’m happy that the destination starts to attract visitors all year round. Hiking, mountain biking, and spa are only a few of the activities that Bansko can propose. And here comes the subject of the hotels. Bansko, in many ways, has over-built its tourist industry. Too many hotels, too much construction has been done. But as I could see this year, the madness had stopped. There are no more construction sites everywhere and the town seems to get in the state it should have been from the first years of its international popularity. Walking the streets, you can feel again the local life bubbling, handcrafters making their work on the street in front of your eyes, the snow capping the mountain contrasting beautifully with the church bell tower. The reason why people like to come to Bansko is because here they can sample the traditional Bulgarian culture and hospitality but also have all comforts they need for relaxing and having fun. And for that matter, the hotel you are staying at is a very important. Hotel Lucky Bansko (Spa & Relax) was not stranger to me as a name. Its reputation was well known and I have heard about the hotel from my friends. But I never have been there before. It is very easy to reach the hotel. Its dark wood coloured building is visual from the main road. There is a large parking area that sometimes is a luxury in such small tourist towns. Arriving, I met … the Ferrari. Isn’t he a beauty? I didn’t understand the meaning of the presence of this Formula 1 car here but it definitely makes people smile and kids crawl on it. At the lobby, I got the impression something is missing. The staff was very polite and quick check-in was done. They told me about the free shuttle going to the first station of the ski lift every 15 or 30 minutes, depending on the time of the day. Everything was fine and well organized. But the lobby was dull. It’s something I find very important. A hotel should make you love it from “a first glance”. My favorite place in the hotel was Leonardo, a gourmet restaurant with a delightful interior, perfect service and prices that correspond to its high standard. The situation in the room was the same – large, comfortable room and living room with a fireplace; clean bathroom and very good bathroom amenities (L’Occitane!). Terrace providing a wide view of the mountains was completing the room. But the interior was in the same dull brownish colors. I loved the good Wi-Fi speed and the comfortable work desk so important for my job. And at breakfast, I saw that the claim “We offer the best breakfast in Bansko” it just might be true. For a gluten intolerant traveller like me, I had plenty of choices to fill my stomach. And the coffee was good too! This program will take in the period of April 1st to November 11th 2017. LuckyFit Program is a combination of healthy diet (without starvation, as the hotel’s site points out) and entertaining physical activities as well as relaxation time. Mountain hikes, horse-riding, yoga and Chinese gymnastics and weight training are part of this program. There are four package programs so check them out to see which one fits your needs the best. The Ayurveda Clinic Lucky Bansko is the first Indian Ayurveda center of its kind in Bulgaria. Read more of what it is and what can do for your body and health following the link above. 14-days full of different games and mountain activities combined with an intense course of English language can create for your kid very happy memories. LuckyKids is organized in the months of June, July and August. The yoga courses at Lucky Bansko are organized 4 times per year. In May, July, September and November you can join the course and have fun with a lot of different activities, not only yoga. Mountain hikes, massages, horseback riding and picnic in the mountains, as well as dances, are also included in the program. These are the main activity programs that the hotel offers but not all! You can also have a psychological training, enjoy the outdoor pool or get lost in the Escape Rooms. And if you are in a mood of an active day, you can always submerge in the seductive spa world in Lucky Bansko. When Woman Travels was guest of Hotel Lucky Bansko Spa & Relax and yet my opinion is always my own and the information shared here sincere.